Successfully Added GPS Receiver + Location Finder + Data Logger + Photo Tagger to your Shopping Cart. Four-in-one functionality and an unbeatable factory-direct price make this USB GPS receiver a great choice for GPS enthusiasts, travellers, and anyone who wants to experience all the thrill of getting lost in the woods but none of the danger. Stocked in our warehouse for immediate order fulfillment and worldwide shipping to any destination whether it's you or your customer. From your best source for cutting edge electronics, Chinavasion. This GPS receiver is compatible with all major brands of GPS computer software. This model includes excellent user-friendly software for the data logger and photo tagger functions. This model does not come with any GPS navigation map software. Languages: English, Spanish, French, German, Dutch, Italian, Portuguese, Russian, Thai, Korean, Japanese, Simplified Chinese, Traditional Chinese. Can I use this to device to find a person? Only if they don't move. 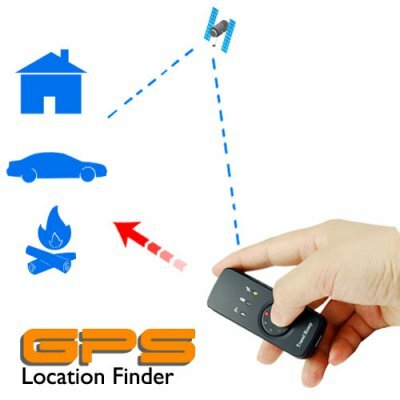 This GPS location finder saves the coordinates of a location, then uses satellite triangulation to guide you back to that location. It is most useful for finding your way back to your car, hotel, or camp. Can I just plug this USB dongle into my laptop and start using GPS navigation right away? In addition to this USB dongle, you will also need to install GPS navigation software (not included with this GPS receiver) on your computer. Once your computer has GPS software, then you are ready to plug in this GPS receiver and start driving. Arived after 3 working days in the netherlands at my door! I use it now for one week and I travel @ 300km a day. Great software, nice small and powerfull divice! Small, light and simple to use. I like it when a product "just works right"
Everything works, realy cool gadget. Just one problem, works with all my maps software, including GoogleEarth. ΠΟΛΥ ΧΡΗΣΙΜΟ ΕΡΓΑΛΕΙΟ..ΕΓΩ ΕΙΜΑΙ ΚΥΝΗΓΟΣ ΚΑΙ ΣΥΧΝΑ ΟΤΑΝ ΚΥΝΗΓΑΩ ΣΤΟ ΒΟΥΝΟ ΧΑΝΩ ΤΟΝ ΠΡΣΑΝΑΤΟΛΙΣΜΟ ΜΟΥ...ΜΟΥ ΕΛΕΙΣΕ ΤΑ ΧΕΡΙΑ.ΠΛΕΩΝ Ο ΔΡΟΜΟΣ ΤΟΥ ΓΥΡΙΣΜΟΥ ΕΙΝΑΙ ΠΑΙΧΝΙΔΑΚΙ ΓΙΑ ΜΕΝΑ..ΕΥΧΑΡΙΣΤΩ CHINAVASION.! on 2009-07-30 04:02:01 Excellent Product Cool Gadget !!!!!!!!!!!!! Received this item today it's a great product will recommend to my friends. Thanks Chinavasion for a great product & service. This GPS data logger works great a no problem at all accurately pinpoint location and can backtrack to your destination. Keep up the great service ChinaVAsion.